What’s your cardiovascular fitness? Do you know what heart rate, intensity, or duration of exercise is best for you? These answers are easier and more accurate to answer than ever before. At NIFS, you have access to the experts and technology that was once only practical for use with professional athletes and in research departments. With our advanced Korr CardioCoach metabolic system, you can reach your fitness, training, and weight loss goals not only safer and faster, but with less fatigue and wasted time. And to make it even better – the test takes less than one hour. Achieve Better Results With a VO2 Assessment! A VO2 assessment can greatly improve the effectiveness of your workout. Whether you’re new to exercise or trying to break through a training plateau, knowing your aerobic capacity is your first step to better conditioning. Who can benefit from aerobic capacity testing? Anyone wanting to exercise smarter: Knowing your ideal heart rate training zone has never been easier. And it’s especially important when your first start to exercise, or when you notice staleness in your program. The fact is, too many people mistakenly exercise too hard and exceed their ideal heart rate. When you know your ideal training zones you’re less likely to over exert yourself. Your VO2 assessment will also tell you the number of calories you burn during every level of exercise. Athletes wanting to train harder: Athletes know there’s no substitution for hard work. You also know that hard work combined with smart work gives you the potential for great accomplishments. Your complete fitness test will include your peak or maximum measured VO2. If you are able to perform at your maximum effort level, then this will be your VO2 max – the maximum amount of oxygen your body can consume. This information is shown along with your Aerobic Threshold and Anaerobic Threshold. Sub max testing is also an option. The bottom line is you can achieve better results in weight-loss, general fitness or athletic performance with an aerobic capacity assessment. 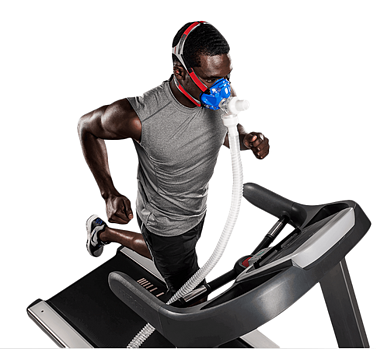 Schedule a VO2 Assessment Today!